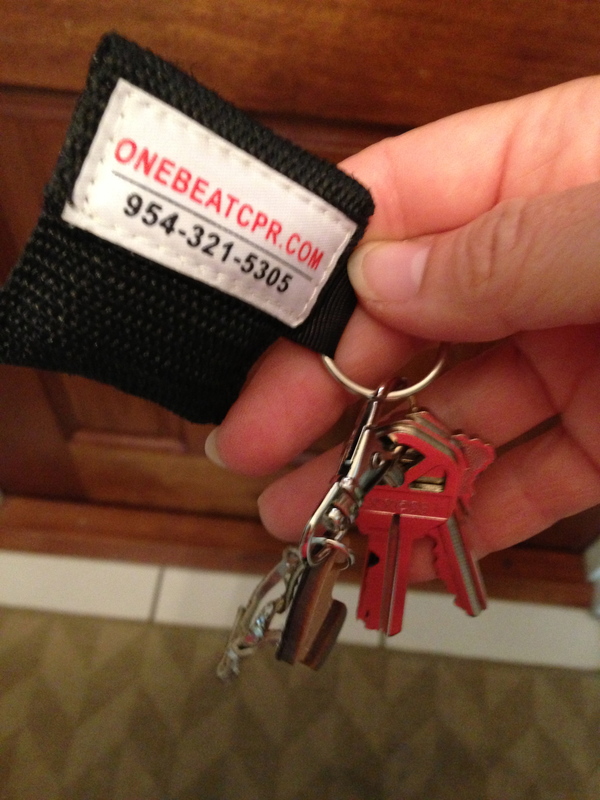 A few months ago, I received in an invitation to attend a CPR training class at Fort Lauderdale-based One Beat CPR. Wow! How exciting! I’ve always wanted to be on the pulse (pun intended!) of what’s new, hip, and exciting for kids, parents, and especially Mamas. Okay, so it wasn’t an invitation to check out a new kid-friendly gastropub, a family-friendly resort, or a Mama-friendly wine bar, but it didn’t take me long to realize it was a hugely important event to attend. Here’s why. I have two children, both of whom I’m finally willing to admit I’m responsible for keeping safe and alive, which is no small feat considering these crazy monkeys spend most of their time stumbling toward disaster. I haven’t been to the emergency room (yet) with my kids, but we came pretty close when Riley face planted in the cement after tumbling down a wheelchair ramp a few years ago. I’ve taken two infant CPR classes – one before each kid was born – and here’s the thing. Within five four three two minutes of leaving each class, I realized I absorbed ABSOLUTELY NOTHING. It was too much information, it was too complicated, there was too much at stake (my baby? ), and there was a lot of denial (that will never happen to me). I hope I’m not alone in admitting that I just figured if ever something happened, I’d call 911, which I’ve since learned is foolish. In the best of circumstances, it can take 4-6 life-saving (or life-losing) minutes for emergency responders to arrive. Clinical experience matters. I am head over heels in love with One Beat CPR, and it’s not just because the folks who run it are strong, funny, and handsome firefighter/paramedic/police officers with heroic stories to tell. (But maybe a little bit.) It’s because they started One Beat CPR after personal experiences propelled them to dedicate their lives to making a difference. One Beat CPR’s founder, Lon Rosen, kept his two-week-old – yes, two-week-old – daughter alive by breathing for her when she was rushed to the hospital with a misdiagnosed congenital heart condition. She’s alive today because her father knew how to administer CPR. There is no wrong way to do CPR. Brian, our instructor, told us a story of a little girl who fell in her backyard swimming pool. The mother discovered her at the bottom of the pool, dove in to get her, pulled her out of the water, and then ran around the yard screaming like a lunatic. The older brother, around nine years old, who had been inside playing video games, heard the commotion and walked outside. When he saw his sister on the ground, he straddled her and pounded her chest with his fists. Eventually, she coughed water and began breathing. There is no wrong way to do the Heimlich maneuver either. Brian told us that in ten years of teaching, he’d never met anyone – with or without certification – who failed to save a life with the Heimlich maneuver. Did some of those people do it without proper technique? Yup. Did some of them injure the person in the process? Yup. Did they save a life every single time? You betcha. There is a standard CPR technique…but, does it matter if you lose count and do 20 compressions instead of 30 or do three breaths instead of two? NO. If you do something, you’re doing it right. Sounds like some excellent Runaway Mama Math to me! You don’t have to do mouth-to-mouth resuscitation to administer successful CPR. Listen, if it’s your kid, a friend, or a family member, you should probably risk the cooties, but it’s legitimate to be concerned about illness and disease as a result of mouth-to-mouth resuscitation. In fact, it’s the one of the top reasons people decide not to get involved. The good news is that you can administer successful CPR solely with compressions (remember doing something is better than doing nothing), and if you take a training course with One Beat CPR, they’ll give you a special plastic mask in a cute little pouch on a key ring that can be placed over a victim’s mouth so you can administer breaths. Defibrillators are NOT scary. Although defibrillators look daunting, they’re actually way more user-friendly than the universal remote control in my family room. You literally press a button and the machine tells you exactly what to do and how to do it. There are even illustrations. It’s like having a one-on-one conversation with Dr. McDreamy while reading directions to put something together from Ikea. Sort of. …a CPR mask, and the confidence to hopefully not run around my yard like a lunatic should I be faced with an emergency. Am I trolling the streets looking for lives to save? Hell no. But I feel EMPOWERED. I feel like I can do something besides say, “Don’t choke,” and that’s pretty awesome. 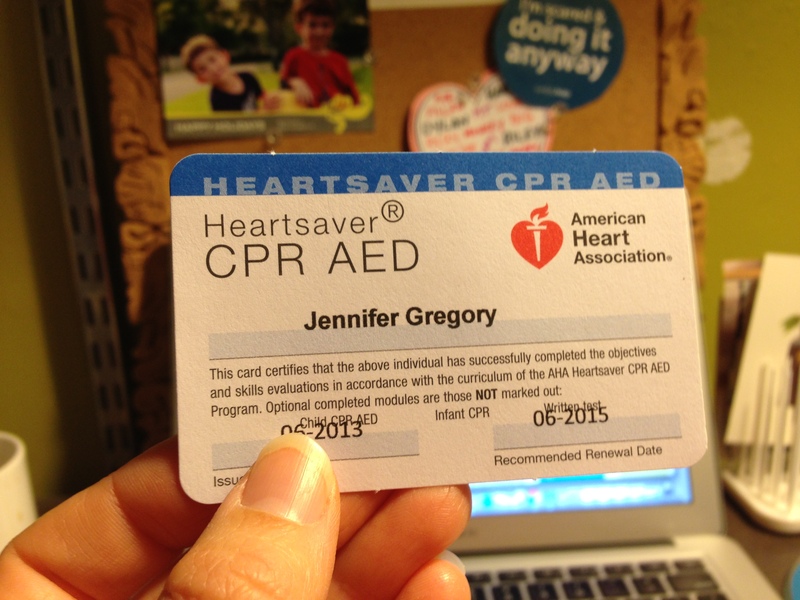 I’m certifiable in a lot of ways (my husband will attest to that), but I’m also officially certified in CPR. Take a CPR class. Find a CPR course taught by people with clinical experience. South Florida folks can contact One Beat CPR. I’ve also been told that One Beat CPR has affiliations with groups just like them all across the country. So even if you’re in Massachusetts or Montana, contact One Beat CPR and they can help put you in touch with someone local to you. Organize a CPR training session for your school, friends, etc. I often volunteer in my son’s classroom, and there were a few occasions during the year when I was alone with twenty kids eating lunch. What would I have done had something happened under my watch? In the fall, I plan to advocate for a mandatory CPR training course for volunteers. Who else? Where else? Does your babysitter know CPR? 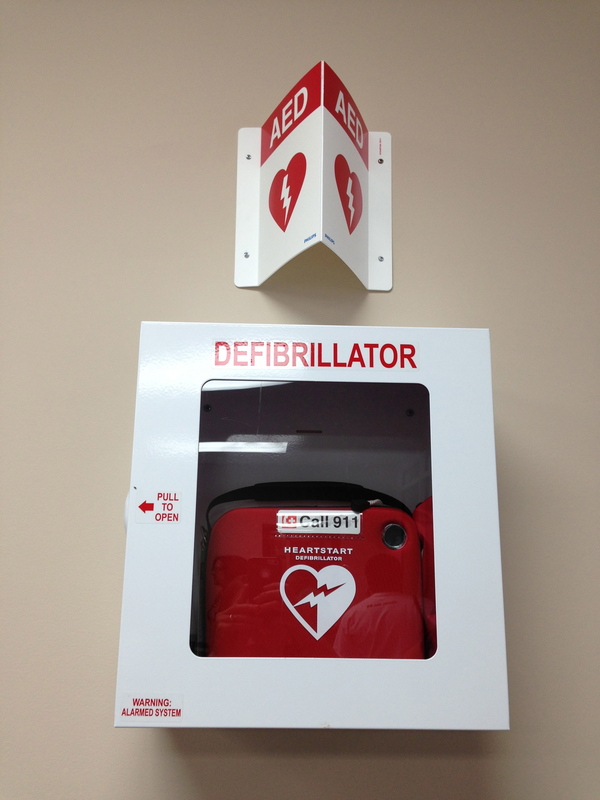 Does the sports organization or park where your kids play soccer (or fill in the blank) have a defibrillator on site? Are the coaches and referees certified in CPR? This summer, my kids are at a day camp with a full-time on-site paramedic. Phew. Don’t be afraid to ask questions and don’t be afraid to demand answers…and change. 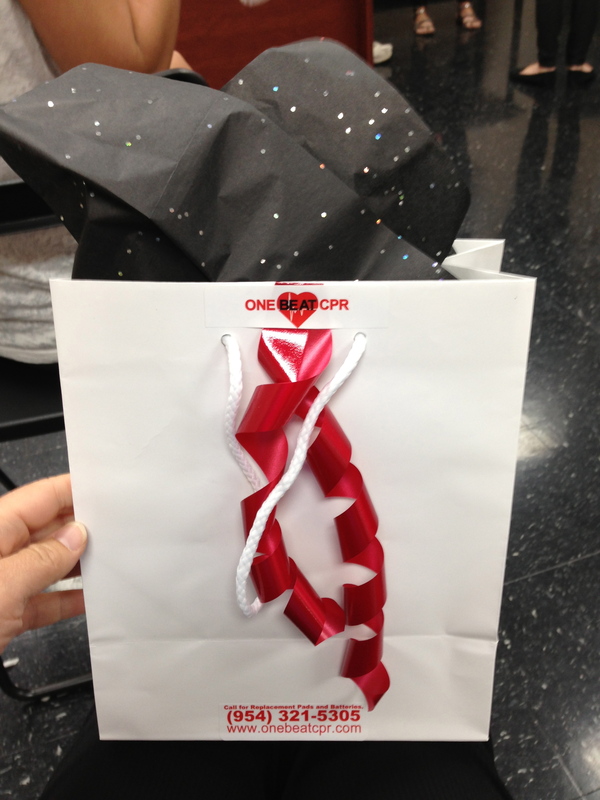 Thank you, One Beat CPR! p.s. Kid-friendly gastropubs, family-friendly resorts, and Mama-friendly wine bars can reach me at therunawaymama (at) gmail (dot) com. I absolutely love this post, for a number of reasons. First, it’s just fun to read your posts. Second, this is a hugely important topic that you presented in real-world terms. After several certification classes in which I struggle to memorize the number of breaths vs the number of compressions (which, by the way, changes every time I take the stinkin’ class), the fact that you need to JUST DO IT and not panic over details like losing count of breaths given is a load off of my mind! I completely understand information overload, and, regardless of how well it is presented, the reality is Lifesaving and CPR by Mom is going to look different than Lifesaving and CPR by Professionals. We moms have a knack for getting to the point i.e. “Don’t drown and don’t choke.” While I recognize the need to add in a few more details, which I am working on, I am a little relieved as well that I’m not the only one. Thanks for sharing! If there’s any taboo about Mamas secretly having no clue how to do CPR, I hope I’ve shed some light and honesty on the topic. This course was really inspiring for me, and I hope I can encourage Mamas everywhere to feel like they CAN be in control of the safety of their families. As always, thank you for reading! Yay! It’s definitely two hours well spent. So glad you agree. I’m happy to help organize it for the entire school community. Thanks for reading! Hi Jen! It’s Brian, that “wonderful” instructor you described!! Thank you so much for spreading the word about thi sworthy and noble cause. I’m really glad you felt our passion for this. Hopefully you NEVER have to attempt CPR, but I’m glad to know you’ll do it with swag if you do all because of our class!!! Wonderful, indeed! Thank you for making CPR feel even remotely possible. I can’t wait to organize a training at my kids’ schools in the fall. Thanks for reading! Good for you! I gotta do this!